Four children evacuated from London at the dawn of World War II find themselves growing up and taking part in the greatest adventure of their lives. Join Peter, Susan, Edmund and Lucy as they travel through a wardrobe to the land of Narnia, where it is always winter but never Christmas. Experience the epic battle between the White Witch, who is determined to keep control of Narnia, and the rightful ruler, the great lion Aslan. Rediscover the magic and mystery of Narnia when UNCG’s North Carolina Theatre for Young People (NCTYP) presents “The Lion, the Witch and the Wardrobe” in Taylor Theatre Nov. 13-22. The university’s theatre students direct, design, perform and stage-manage the show, which is intended for children in grades one through eight. The dramatization by Joseph Robinette faithfully recreates the C.S. Lewis classic, winner of an American Library Association Notable Children’s Book Award. It offers an inspiring message about the ability of individuals to change the world for the better. “In the midst of fear, they find courage,” adds Rachel Briley, a faculty member and artistic director of NCTYP. The play raises questions for performers and audience members alike. The youngest child, Lucy, is the first to visit Narnia. Is this because, as the youngest, she has the strongest imagination? In the midst of fear, they find courage. Audiences will be captivated by the professional-quality production values. Erika Grayson designed the sets; Angela Howell designed the costumes; and Kate Devine designed the lighting. 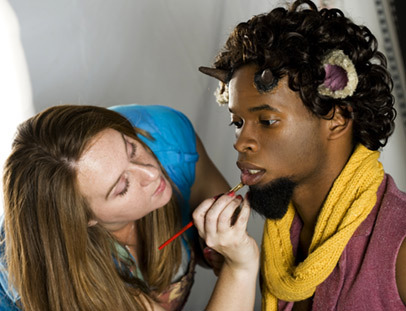 Founded in 1962, NCTYP has performed live theatre for more than 2 million children in Greensboro and across the state. Performances are a learning experience for the cast, design team, production team and crew, along with the audience. Performances are in Taylor Theatre, 450 Tate Street, at 7 p.m. Nov. 13, 14, 20, 21; 2 p.m. Nov. 14, 15, 22; 9:30 a.m. Nov. 17-20; noon Nov. 18, 20; and 1 p.m. and 4 p.m. Nov. 21. Tickets – $15 for adults; $12 for children, seniors and non-UNCG students; $9 for groups of 10 or more and UNCG alumni; and $7 for UNCG students – can be purchased at the door beginning one hour before performances or from the UNCG Box Office.